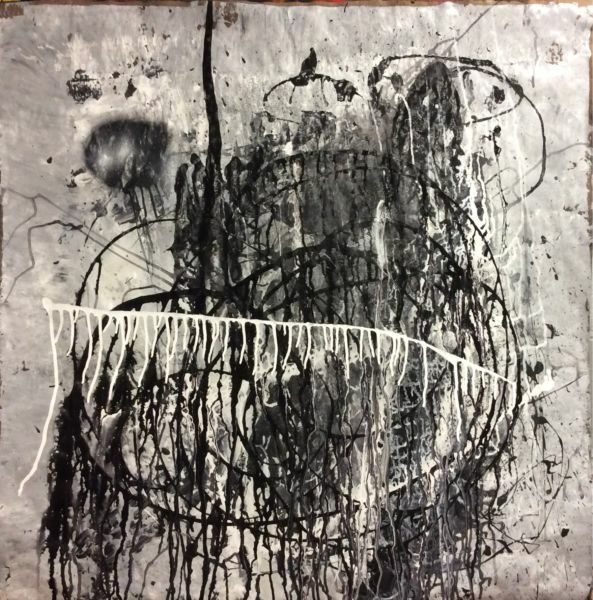 Acrylic and oil on paper , 35" x 35"
Influences and Inspirations – Jackson Pollock, Franz Kline, Gerhard Richter. Winslow Homer. Picasso. Bill Watterson. Berkeley Breathed. Vaughn Bode. And all the velvet Elvises that ever were. Awakening (or whatever you want to call it) – Until the age of 63 I had zero interest in painting of any kind, much less abstract. The reason I began sounds like an outtake from “The Sixth Sense”. My wife and I bought a unique little house formerly owned by a woman named Adele Erisman, who had been a painter and who had died there. I do not believe In the afterlife, ghosts, or little green men, but shortly after moving in I awoke one morning certain that I had to paint. Perhaps Ms. Erisman whispered in my ear; perhaps it was just time for me to move into this new and sublimely beautiful phase of my life. In any case, Adele is my official muse, and I am reassessing my preconceptions about the supernatural. Education – I am a self taught (or uneducated, take your pick; Adele doesn’t provide instruction, only impetus) abstract artist, working in acrylic on paper, panel and canvas. I occasionally use paintbrushes, but most of the time my equipment of choice is a plastic putty knife or a strip of plexiglass (in the manner of Gerhard Richter). Or a strong right arm (splat). Process – Jackson Pollock, or one of his chroniclers, allegedly coined the term “action painting”, which I have roughly translated to mean, “I’m making this up as I go”. I generally use cheap plastic putty knives and house paint, which makes the material cost of a screw up more acceptable. Someone asked me what I think about when I paint. Answer: I don’t know. Painting is for me such an intense, immersive, and subconscious experience that all I can say is that I work until I’m done, or at least until I come up for air. In the end, I throw paint on a surface and push it around until I get something I like.